Screw the joint on the female threading seat. 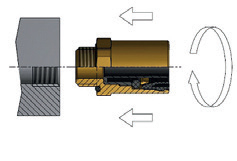 For a correct assembly of each joint follow the tightening coupling instructions given in table 1. 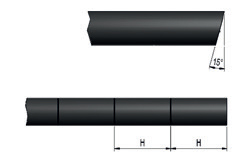 The pipe must be cut at a right angle or up to a maximum of 15°. The coupling is correct only when the pipe reaches the coupling value given in table 2. If the pipe bears a reference mark it must be cut exactly at that point. Insert the pipe into the joint rotating it slightly to ease the insertion. 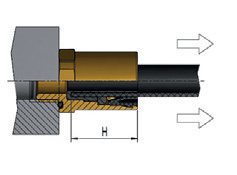 The pressure required to insert the pipe is given in table 3. The pipe is correctly fitted when it reaches the bottom of the joint. If there is a reference mark make sure the cut is flush with the joint. Pull on the pipe to make sure it is correctly fitted in.